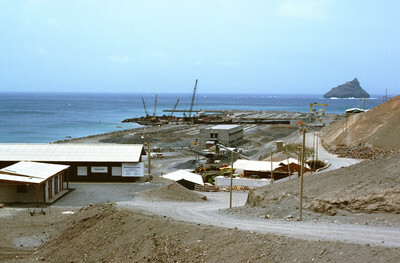 This 1983 photograph shows Funding was provided in the late 1970s to modernize Porto Grande, the largest port in the country. Here expansion is under way. On the horizon, the uninhabited islet, Ílhéu dos Passaros, marks the border between Mindelo Bay and the Atlantic Ocean.